1 Knead together the flour, baking powder, sugar, vanilla sugar, butter (in pieces), egg white and ground hazelnuts. Form into a ball, wrap in clingfilm and put into the fridge for 30 minutes. 2 Roll out about 0.7 cm thick on a floured work surface and cut out round biscuits (about 5 cm in diameter) using a round cutter with a wavy edge. 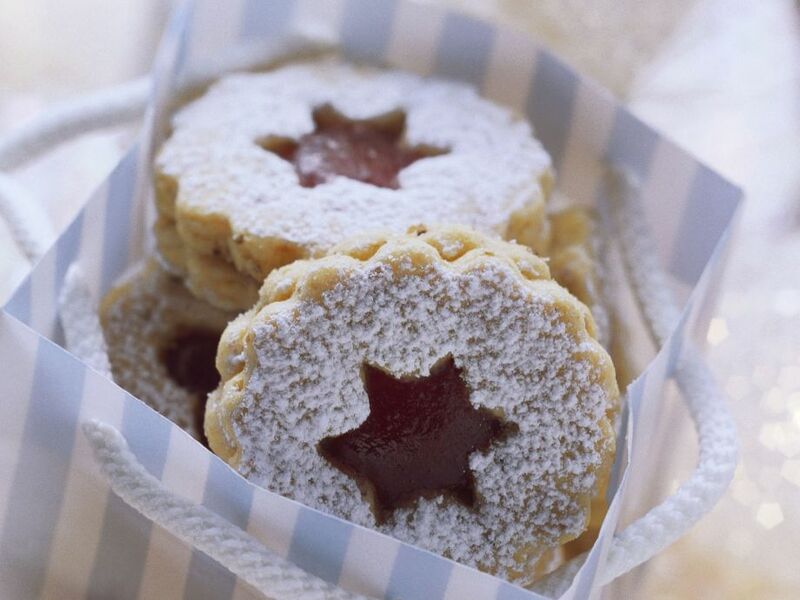 Cut small stars out of the middle of half the biscuits. 3 Lay the biscuits on a baking tray lined with baking parchment and bake in a preheated oven (180°) for about 12 minutes. Take out and leave to cool. 4 Warm the jelly and spread the whole biscuits with it. Sandwich in pairs with the, star’ biscuits, press together slightly and leave to dry. Dust with icing sugar.